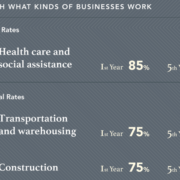 Infographic – Why do businesses fail? For any new entrepreneur, it’s natural to be optimistic. Whether that person has a world-changing idea or is starting a new coffee shop, the glass has to be half full that the business will succeed. Otherwise, what is the point of starting a new company in the first place? Have a look through this infographic with US trends. http://saban.org.za/wp-content/uploads/2017/09/business-survival.png 1132 1734 SABAN http://saban.org.za/wp-content/uploads/2014/09/saban-south-african-business-angel-network-logo-201x300.png SABAN2017-08-03 13:22:002017-09-11 23:30:56Infographic - Why do businesses fail?